Have you connected with Sacred Land and your Ancestral lineages as shared in the first Pillar? If not, there is no better time than the present. I have created a couple of videos to help you do just that. The next Pillar of Power and Wellbeing is the Pillar of Purification. As you may have guessed, this core tenet of Energy Healing focuses on the practice of self purification as a means to maintain balance, health, wellbeing, personal power, and even brilliance! Purification is the process of making pure or clean. From an energetic and spiritual perspective, this means removing, transforming, and reducing thoughts, habits, energies, substances, and spiritual forces that move us away from our highest expression of Love and Light. Food can be amazing source of purifying and restorative energy and yet, for the mainstream consumer, it has become a colossal source of toxicity, suppression, and control. Modern, highly processed foods dull our senses, carry a tremendous toxic chemical load, and vibrate at lower frequencies. They are designed to appeal to our primitive brains and create a chemical dependency. Minimize processing and intake of pre-packaged foods with more than 10 ingredients. Not considering the individual’s unique chemistry and physiological needs, these guiding principles will form a strong foundation for clean, purifying nutrition. As social beings, humans always form small groups of people around whom we spend the majority of our time. As conscious living beings, we are constantly projecting parts of ourselves onto those around us. What is being projected onto you by the people you spend the bulk of your daily hours with? Chances are, if you are like most, that the people around you are conditioned by the negative influences of a faced paced, high stress modern society and are thus projecting onto you the issues and negativity that will naturally result. Where do you live? You most likely you already know that, depending on where you live, your energetic field might be continously bombarded by invisible and disruptive artificial electromagnetic fields produced by the modern technological marvels that run our society. Smart phones, computers, tablets, wifi, bluetooth, power lines, cell phone towers, and countless more devices and appliances are constantly generating energetic fields that disrupt our own. Light pollution from artificial illumination, sound pollution from busy cities, air pollution from vehicles and industry, toxic clothing and personal care products all tax our health and wellbeing at all levels. grounding by being barefoot on earth. The things we do for entertainment encompass all of the other categories, including food, people, and environment. The next time you think about fun, consider the people you are having fun with, the messages being transmitted to you through shows, music or movies and the quality of the foods you are taking. Are these things helping to raise your vibration and consciousness? Go for an invigorating hike or walk in nature. Chat with conscious, kindred spirits. Take a relaxing picnic with caring loved ones. These are all powerful ways of cleansing, detoxing, and purifying one’s self on all levels in order to be the best possible healer and source of light and inspiration to others. 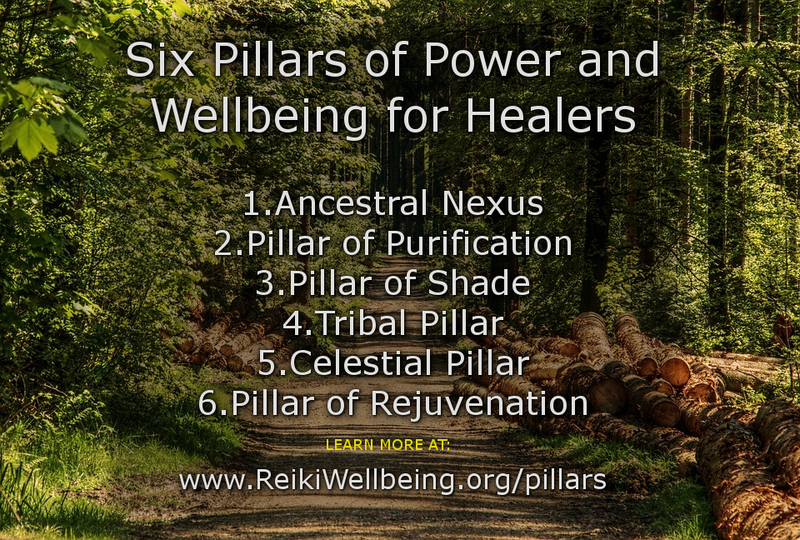 Looking forward to reconnecting with you with the 3rd Pillar, available on May 31, 2018 at https://reikiwellbeing.org/shade.